Ulster have signed Irish-qualified England Under-20 lock Kieran Treadwell. 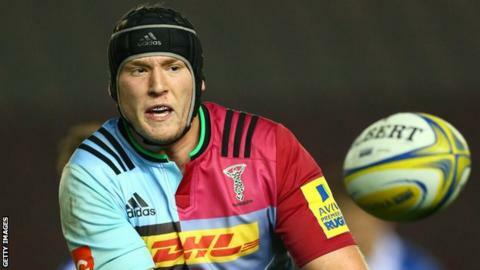 The second row will move to the Irish province from English Premiership club Harlequins on a two-year deal at the end of this season. Treadwell won four Ireland Under-18 caps in 2013 but helped England win last year's Under-20 Six Nations title. "This was a very difficult decision to make but one that I feel is right at this stage of my career," said the 20-year-old. "I'm really excited about the opportunity that lies ahead with Ulster. "They are an ambitious club with lots of young talent coming through into the first team, a number of whom I played both alongside and against for Ireland Under-18s and England Under-20s. "There is also a very clear pathway for me at Ulster if I work hard and impress the coaching staff." Ulster's director of rugby Les Kiss described Treadwell's decision as "hugely exciting". "It is key for us that we are not only successful at provincial level, but that we can produce viable candidates for the national team," said Kiss. "We believe that Kieran has the goods to deliver this. He is a big, uncompromising ball-carrier and he has a natural athletic ability that belies his size." Earlier this week, Ulster announced that Connacht's Ireland prop Rodney Ah You will move to the Kingspan Stadium club at the end of this season. All Blacks utility back Charles Piutau will also join Ulster in the summer on a two-year deal.